Where to go in Berlin? Where to sell your Clothes? Get our newsletter for exclusive deals once a month for our best shops in Berlin, offline and online. So there’s a new season starting and you are a good girl/guy, you know how bad it is for a free mind to have this bunch of stuff you never wear. It’s too good to be thrown away and you think you can get a little bit of money out of it. 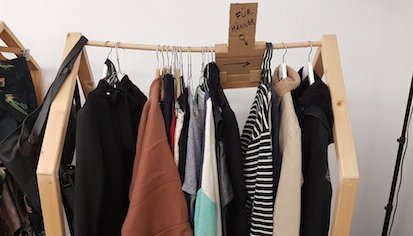 So where and how to sell your clothes in Berlin? You may need to consider which kind of stuff you have and if you’re willing to sell it yourself or not, which will lead you to several options. Each store has its own style so it’s important that you figured where you have the best chance to sell your garments. At the end, it’s always the people there who will say yes or no. At some places, you can just drop by the store with your bag but it’s better to get in touch before, by phone or email. First, some shops work only with an appointment but even for the others, you might pop in a busy moment or the shop has temporarily stopped to buy because they have too much stuff already. The commission they take is usually between 40% and 50% and they warn you when an item has been sold. It’s quite obvious but let’s remind you that your clothes should be cleaned, in good shape and it’s always a bit annoying if you removed the brand label for some scratchy reasons. Designers Vintage and Premium 2nd Hand. Without appointment except for plenty of clothes. You choose the prices together with the owner and they take 50% commissions. Individual conditions for Luxury items. High-end designer fashion and accessories. The items should fit the season. Without Appointments except for plenty of clothes. You choose the prices together with the owner and you´ll get 50% of the price, which is paid once the item has been sold. Chrome sells 2nd hand and vintage for men and women. The style is strong, classy and modern. For a small batch of clothes just drop by the shop otherwise call or send an email for an appointment. The deal is 50/50. Garment represents two shops selling vintage and 2nd hand for women. Here is the kingdom of cult designers who have the talent to make any woman sublime. Garment is for women who like to be looked at. Just drop an email to get an appointment. If you´re French or if you have a little crush on French fashion label, this store is for you. The owner has definitely a crush herself so it´s the perfect place to sell such brands or other having a french touch. Only for women. The Good store is a very good compromise if you have a different kind of brands range. The owner is very aware of the last trends and the shop always look super appealing. Therefore you´re pretty sure to sell your clothes quite quickly. The deal is 50/50 for prices that you decide together. The clothes you bring must be seasonal. Just drop by the shop or ask for an appointment if you have a lot of stuff. Also look like the closet of some girlfriends where we like to dig into. Kleider Laden sells all kind of clothes, from little black dresses to vintage grand soir outfit to super trendy skinny jeans. Get in touch with them to get an appointment and you´ll get a direct offer for the price. Patrick and Arianna own two 2nd hand and vintage shops in Friedrischain, Sometimes Coloured and King Kong. They buy directly your stock of garments as long as it’ trendy or timeless and sophisticated stuff. A cute and nice little shop all red from outside and standing on the Lausitzer Platz, selling 2nd hand kids clothes, shoes, toys, and books. You can bring some clean, seasonal kids clothes to sell directly to them, as long as there’s no holes or such things and that it’s not bigger than a normal shopping bag. They’ll offer you a price after a couple of days and if you accept you get the money directly. Limonadenbaum sells a mix of 2nd hand and new clothes for baby and young kids (until 8), as well as shoes, accessories or toys. You can drop by with your kids stuffs to sell, they will look at it and get back to you after 2/3 days and you can decide if you buy with commissions or not. Have you more addresses to recommend? Just add a comment below! Another good place to sell clothes is Collect in Kreuzberg. The girls are very nice and you can also find nice pieces to buy! Thank you Emilie, for all the good addresses, I love your blog, it’s really inspiring and it has become a regulary read for me since I first discovered it more than a year ago.